Often, one of the most contentious issues in a divorce proceeding is the division of marital property. California law clearly states that courts shall divide the community estate of the parties equally. Therefore, it is incumbent upon the court and the parties to identify, characterize, and place a value on the assets and debts to be divided. Assets include many items, including the family home, bank accounts, stocks, and retirement benefits. Identifying all of the accumulated marital assets is a complicated procedure, especially when spouses do not agree on the characterization of each item. To be sure that your financial rights are protected in a divorce, you are encouraged to contact an experienced family law attorney from the local San Diego area. In a recent controversial divorce case, the California court of appeals was asked to review only one question: how to divide the couple’s retirement benefits. Here, the parties were married in 1994 and separated in 2010 when they filed for divorce. Throughout the marriage, both the husband and the wife were attorneys who worked in separate positions. The husband worked in a private practice, while the wife worked for the LA County District Attorney’s office. He made contributions to Social Security via mandatory payroll deductions, while she participated in a county retirement plan (a defined-benefit retirement plan). They entered into stipulated judgments covering the custody of their children and the division of marital property, with one exception: their retirement benefits. At the time of their divorce, the wife’s retirement fund was valued at $210,000 to $216,000, while the husband’s Social Security was valued at $228,000. The parties agreed that under current law, the husband’s Social Security was separate property (not subject to division), while the wife’s retirement benefits were community property. The trial court rejected the wife’s argument and concluded that it was required to follow state law and divide the wife’s retirement benefits equally. In so holding, the court also noted that treating the husband’s Social Security benefits as a “set off” is barred by federal law. The wife appealed, asking the court to consider equitable ways to divide the parties’ retirement benefits so that her husband did not receive 75% of their combined benefits. The court of appeals reviewed California and federal laws (in addition to the treatment of this issue in other jurisdictions), and it concluded that it had no choice but to affirm the lower court’s decision. Social Security is separate property, while the retirement benefits in this case are community property. The court plainly noted that California law “mandates the outcome in this case…” Furthermore, the court pointed out that the Family Code does not permit courts to make unequal awards of community assets. Instead, courts are required to divide the benefits equally. As part of its decision, the court noted that while the outcome was not equitable, it did not have discretion to fashion the type of award the wife was seeking. Also, the court pointed out that parties are free to craft a mutually agreeable solution as to the division of property to avoid this scenario altogether. Clearly, if you are considering divorce, it is vitally important to understand the laws surrounding the division of property in your jurisdiction. 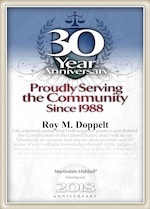 Roy M. Doppelt has been representing parties involved in family law disputes for more than 20 years. Doppelt and Forney, APLC serves clients throughout Southern California, including San Diego, Encinitas, La Jolla, and Chula Vista. For a free consultation, contact Doppelt and Forney, APLC through our website, or give us a call toll-free at (800) ROY IS IT (769-4748).